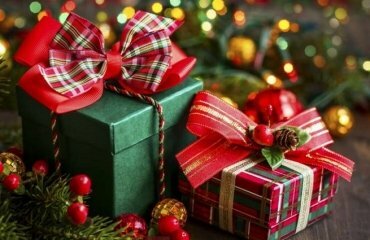 Every year housewives are looking for original Christmas table decorating ideas as they realize that a beautifully decorated table adds tons of festive atmosphere. 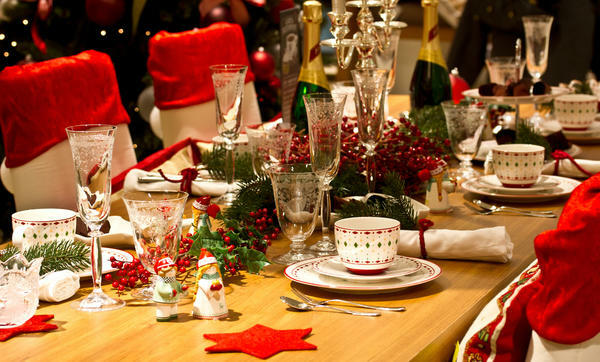 It is not necessary to spend a fortune of table decorations. Everyone can lay a beautiful table with inexpensive accessories. 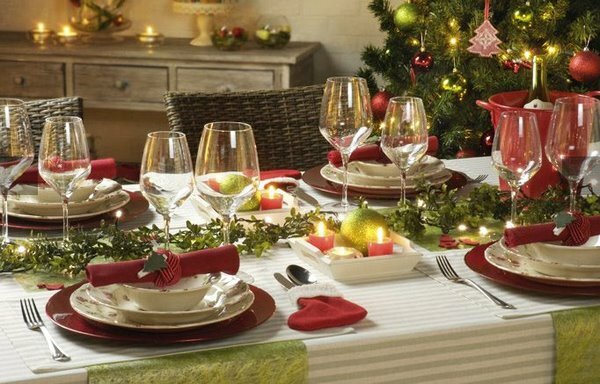 When decorating the table, besides its appearance, you need to pay attention to the comfort of the guests – when properly seated, people will be comfortable talking to each other and using their cutlery. 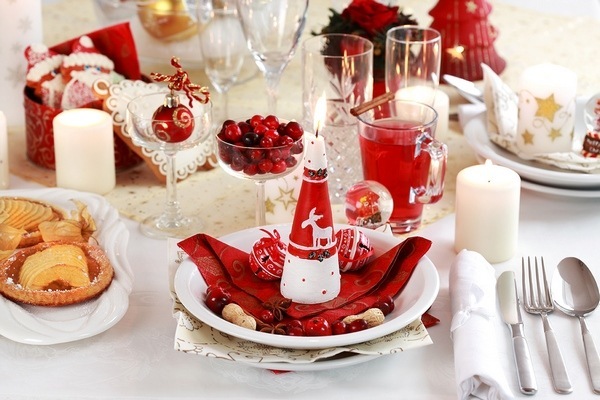 Festive and joyful atmosphere can be created using the most ordinary things – napkins, candles and flowers. All you need to do is to see and use them in a new way. 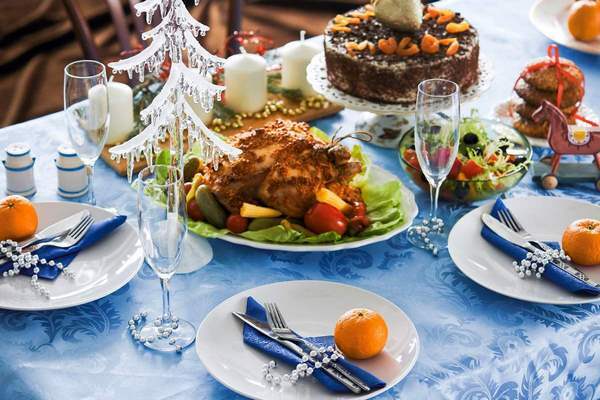 We shall help you with ideas, tips, decor themes and of course, the rules for setting a dinner table. Classical chic is a decoration theme in traditional colors red and green and these tones should dominate. 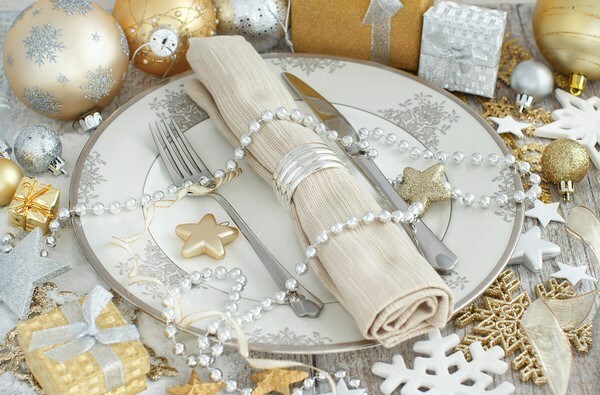 A white tablecloth as a contrast is the perfect base for classic decorations. 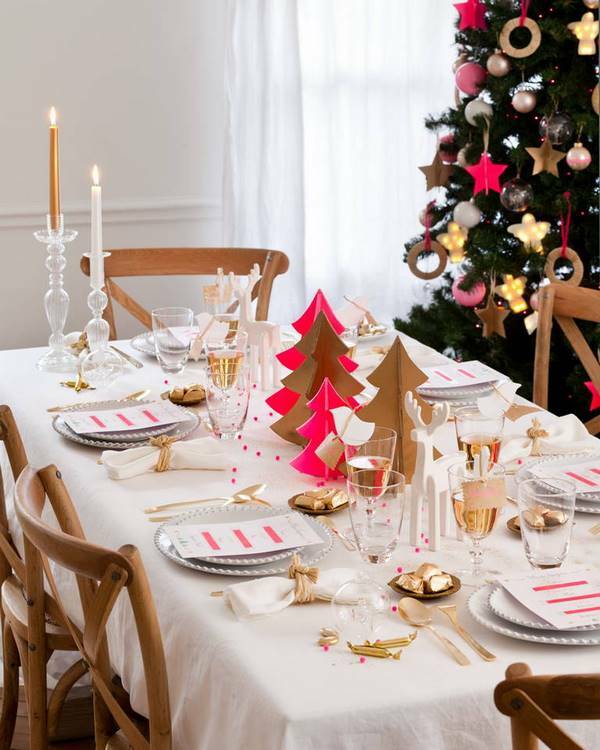 Optionally, you can choose a tablecloth in warm tones (even a Scottish tartan pattern) and white tableware. Decorative elements such as a dark wood, a wreath of fir branches or a glass candle holder will look beautiful as centerpieces. 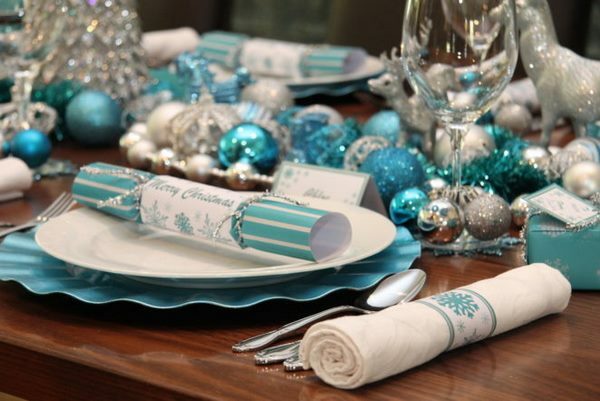 Winter Wonderland Christmas table theme allows you to create a fairytale! Choose blue, white and silver colors. 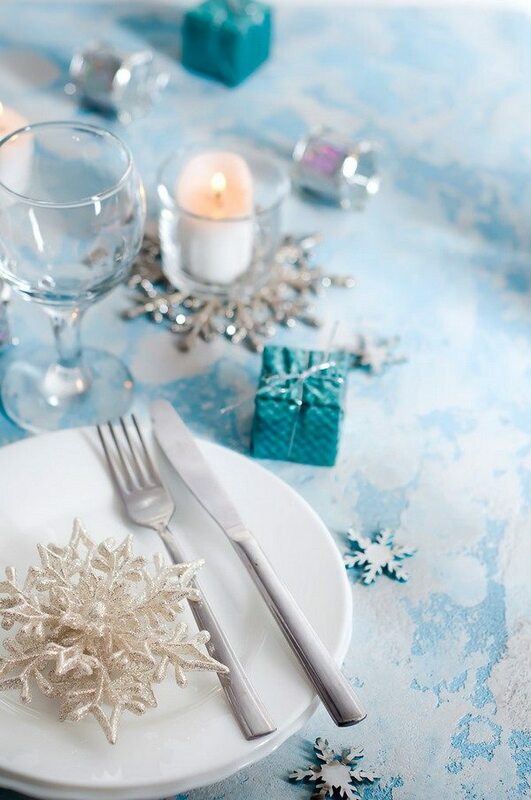 For example – a blue tablecloth, a centerpiece of silver cones, small blue and silver gift boxes on the plates, blue linen napkins with floral Christmas patterns can be arranged in wine glasses. 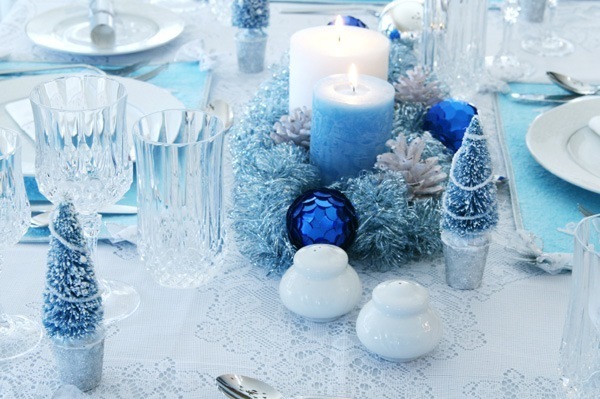 Add a few crystal candlesticks with blue or silver candles which will fill the space with special charm and their warm glow will be reflected in the decor elements and make the atmosphere more festive and magical. 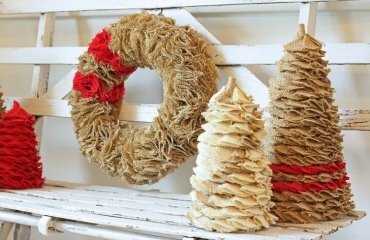 You can use only silver and white or if you want a more rustic touch, add red color so, as you see, there are different options. 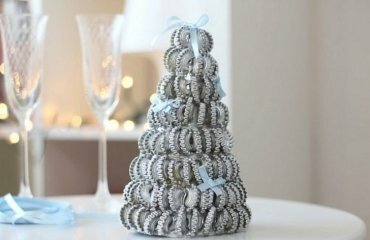 Glamour is another option for a magnificent Christmas decor. 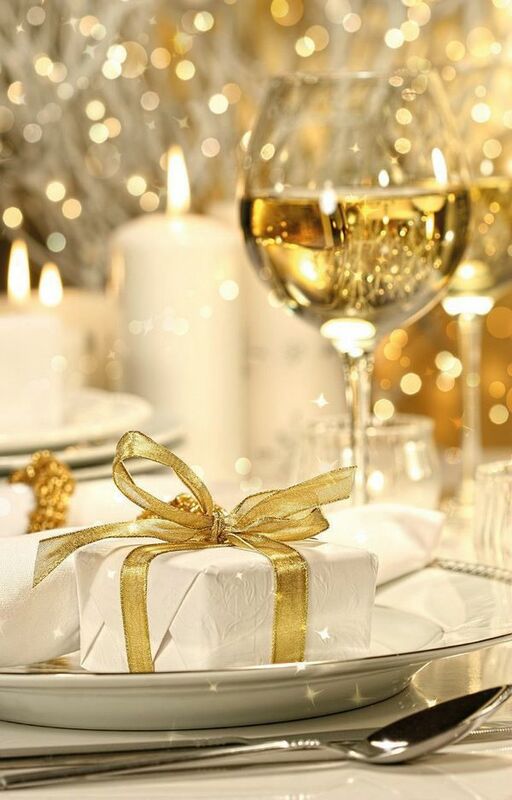 Go for lavish gloss and shine – fill glasses with silver or gold beads, place crystal candlesticks with silver or golden candles in the center of the table, sprinkle gold or silver confetti, silver or gold garlands can be used for decorating the chairs. 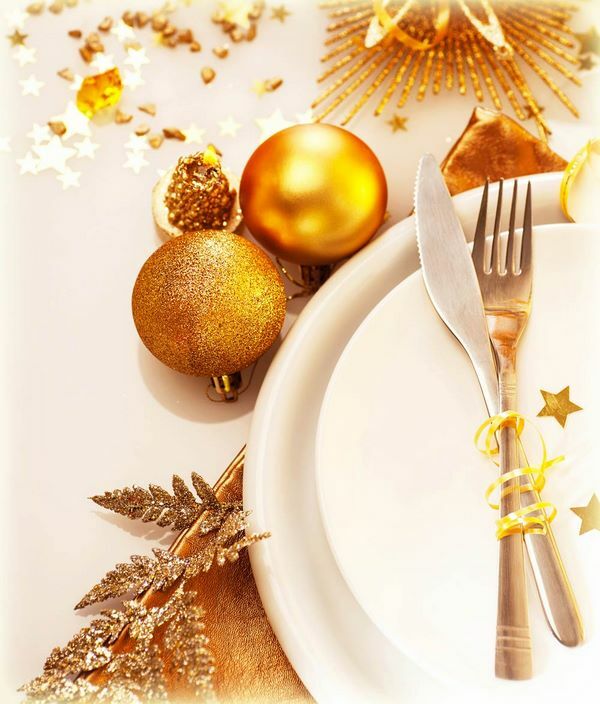 Gold and white theme is a great choice. Do not be afraid to combine these colors. Off-white or cream can also be used. 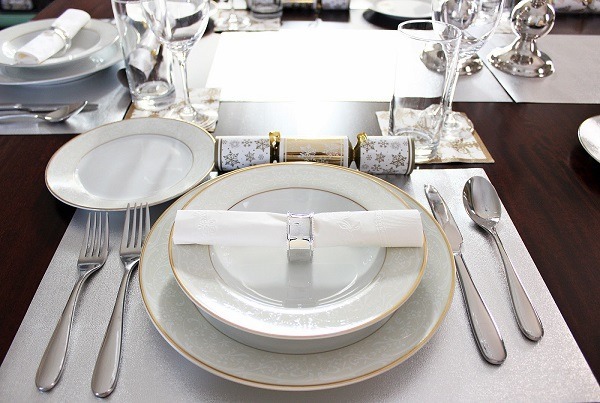 Glass or patterned plates will highlight cutlery in gold or silver. You can add natural elements like bouquets of white flowers, candles, branches painted in off-white, etc. 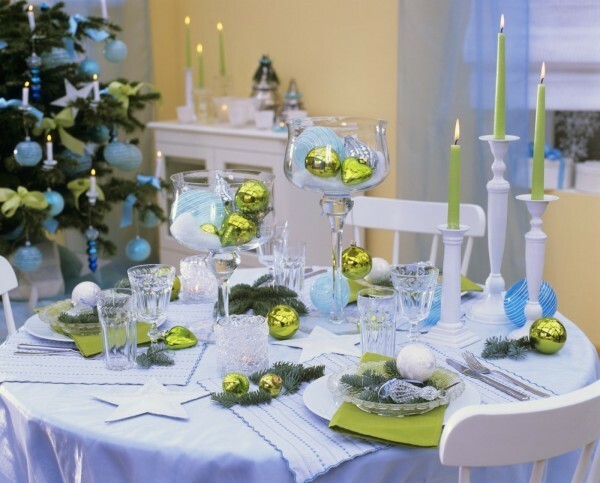 One of the trendy Christmas table decorating ideas is a simple and clean yet warm, Scandinavian style setting. If you have a table of light wood such as maple, ash or even oak, you can highlight it by using a simple runner. If you do not have a light wooden table, a beautiful white or beige embroidered linen tablecloth will give you the desired effect. Choose white or red dishes. 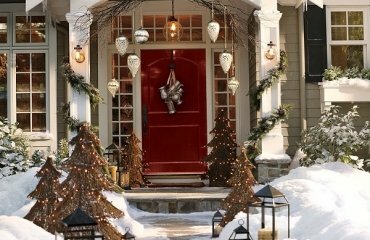 Add lights and accessories – candles, pine cones in jars, etc. 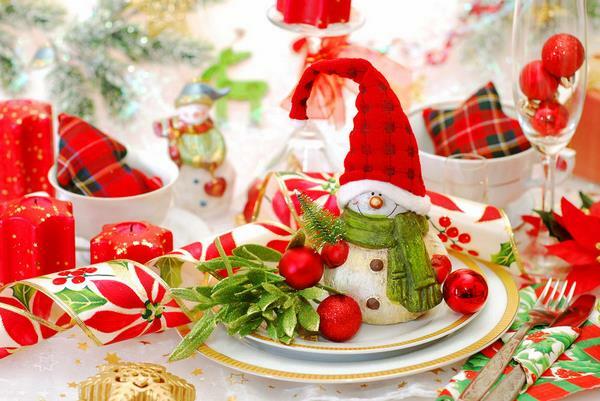 Christmas table decorating ideas look so attractive not only for the creativity and originality. These tables are set as per the rules, which is the most important factor that determines the comfort of the diners. Do you know how to set a dinner table? Well, we shall help you and explain the rules. 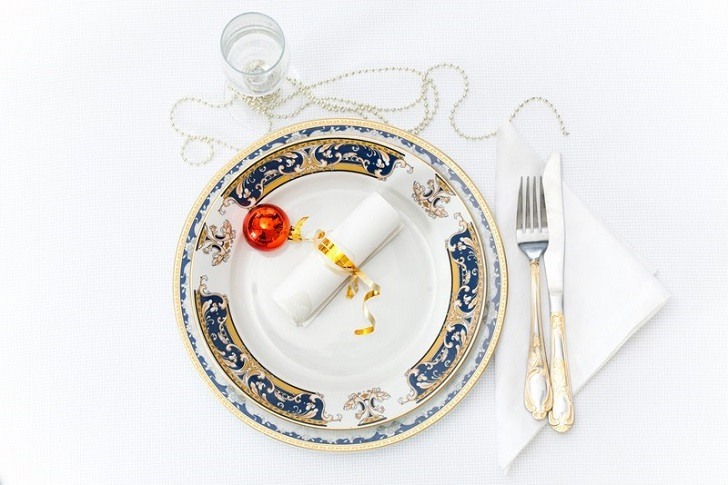 You can choose a formal dinner setting or a opt for a more informal approach. On the first place, you need to remember that the optimal personal space per person is 50 or 60 centimeters. Guest chairs should be placed on both sides of the table, opposite each other. The ends of the tablecloth should hang down 30-35 cm on all sides. Napkins. They can be folded in a triangle or in another pattern. For each set of plates you need a beautifully folded cloth napkin. Cutlery. All cutlery should be placed at a distance of approximately 4cm. Put the fork to the left of the plate, teeth up. On the far right is the spoon, just to the side is the small knife for starters and dinner knife, knives’ edges must be turned towards the inside of the table. Dessert spoons and forks are placed to the right of the knife. 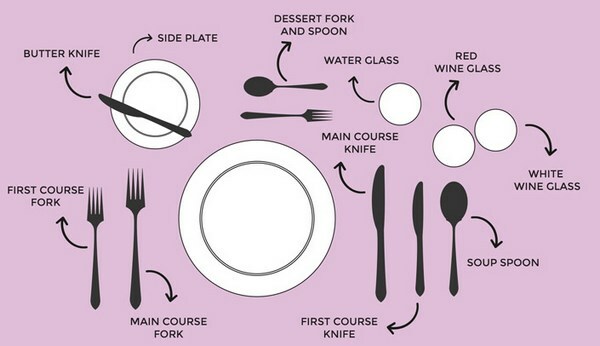 Forks are always placed to the left of the plate in the order that will be used starting from the outside. Glasses are placed to the right of the plates above the table knife in the order in which drinks are served. Bread and butter plates go to the left with the butter knife placed across the plate. Salt and pepper shakers are placed in the middle of the table in special stands. Vases with flowers – for a large table you will need a few bouquets or a small bouquet next to each guest. Flowers should not block the dishes and the visibility of guests. In conclusion, we can say that the main principles for setting a dinner table are the comfort of the guests and as far as decoration is concerned, you need to make sure that all elements are combined harmoniously with each other: tablecloth, napkins, dishes, bouquets of flowers and light sources. 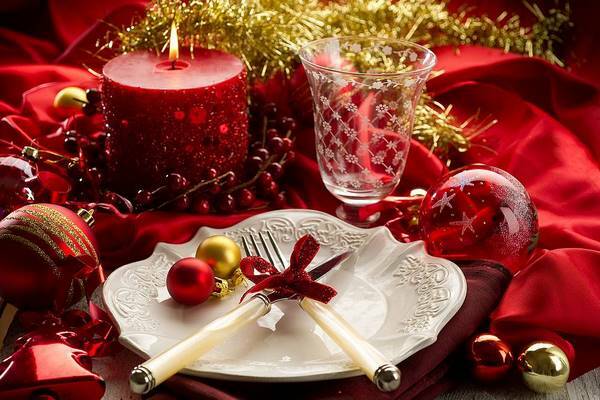 Enjoy the Christmas table decorating ideas gallery and find your inspiration.